PollingGuru.ca | Jenkins Research Inc.
PollingGuru.ca went live several weeks ago as a place, outside of my corporate site, to share the current state of public opinion in Canada. One the site, you will find a range of articles and posts about current and past public opinion research in Canada. You will continue to find interesting articles here and the main archive of the public polls project will still be hosted here. Why did I create a new site? Several reasons. First. In a world where traditional journalism is under fire and media outlets are being constrained, consolidated or closed, I felt there was a need for a non-partisan, though undoubtedly opinionated, place to share and reflect on what Canadian think about the world. Since I am neither being paid or in any other way compensated for what is said on the site, it differs from the other polling data that is released. Second. Most polling data that is released is provided as a discreet event. It is released, it may get coverage or attention, and then we move on. PollingGuru.ca offers us an opportunity to better understand each new poll in the context of the other research that has gone on before. This is why the site will consciously reflect on long-term trends as well as recent polls. Third. Canadians invest considerable amount of time and thought to providing pollsters answers to a wide variety of questions, and this can be the place where Canadians can see how that information is being used and to better understand what we think. 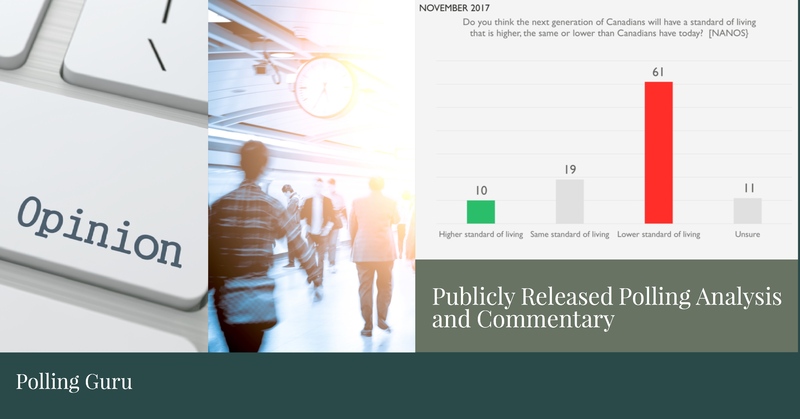 There have been over 800 publicly released poll results in 2017 in Canada and PollingGuru.ca will continue to capture and understand the wealth of information carried in these polls. If you have comments, suggestions or would like to help, please let me know.